A man was seriously injured after stepping on a landmine in northern Shan State’s Namtu Township on Monday. Landmines found in temple ground in Namtu Township in May 2017. Sai Ba Nyan, the vice-chairman of the local aid committee in Namtu, told Shan Herald today that the accident occurred at about 10.30am in Pang Marn village, Zai Khao village tract, in Namtu Township. The victim, Sai Pan Aung, aged 20-30, was walking on a track to his farm. He said there were a lot of landmines all over the area due to the ongoing conflict and that local villagers had been warned about walking outside their communities. Sai Pan Aung was injured because he didn’t heed the order, he said. Clashes have been regularly reported between Burmese government forces, the Restoration Council of Shan State/Shan State Army (RCSS/SSA) and the Ta’ang National Liberation Army (TNLA) in the Namtu area. On July 6, Shan Herald reported that over 300 villagers in Namtu Township had reportedly fled their homes due to fighting involving the RCSS/SSA, which is one of eight armed groups to sign a Nationwide Ceasefire Agreement (NCA) with the government, and the TNLA, which was largely excluded by Naypyidaw from the peace process. According to the Landmine and Cluster Munition Monitor, a research and monitoring arm of the International Campaign to Ban Landmines (ICBL), Burma was ranked third most dangerous country in the world for landmines in 2014 behind only Colombia and Afghanistan. The ICBL report on 25 November 2015 also highlighted the numbers of landmine victims between 1999 and 2014. The report said that there were a total of 3,745 people affected by landmines in Burma, which included 396 killed; 3,145 injured; and 204 unknown. However, it noted that the real figure could be much higher. In May this year, eight novice monks in Namtu were seriously injured after a landmine exploded while they were playing with it. The next day another 23 mines were discovered near the temple compound. 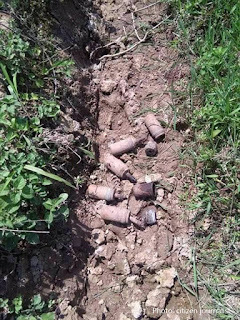 Among several other incidents in Shan State, a man was killed after stepping on a landmine in Mong Kyat tract in Lashio Township.